Ohhh my…this is chocolate decadence in liquid form. The Valrhona mocha comes in either an 8 or 12 ounce cup size. I can’t imagine drinking more than that because it is such a rich drink. Vahlrona is a French chocolate manufacturer and they are known for a higher grade luxury chocolate so you are in for something special if you order this. Most places will use a standard chocolate sauce to make their mochas and then top it with whip cream and maybe a dusting of chocolate powder to make it all pretty. I just knew Barista wasn’t going to go that route. I watched the staff person reach for a glass jar on a nearby shelf and he started putting chocolate chunks directly in a cup. Oh yes, their process is melting the chunks with warm milk into liquid chocolatey heaven. No whip and no sprinkles are needed. It’s rich on its own and for the first time I went against my normal non fat milk choice and went for whole milk just to enhance the chocolate experience. Their menu states there is 20 grams of 61% bittersweet chocolate per 8 ounce cup. This is not a sweet beverage so don’t expect it to taste like the hot chocolate most people are all accustomed to. But if you like dark chocolate then you will appreciate this version. It’s indulgent, decadent and probably 500 calories but you won’t be thinking about that when you drink it. 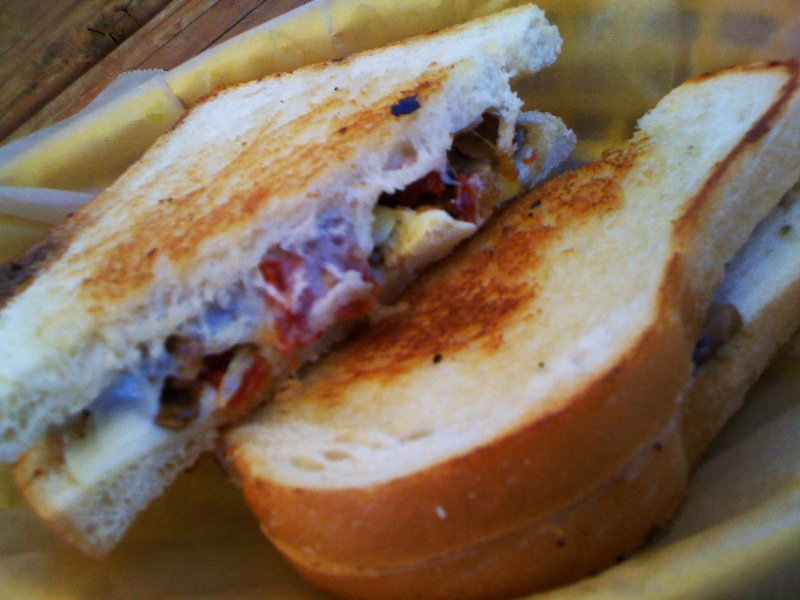 The Grilled Cheese Grill is a food cart located in inner NE Portland that serves up the traditional variety along with some added sandwiches to please everyone’s palette. You really can’t miss this cart with the big yellow school bus that sits on the corner of Alberta and NE 10th Ave. I love that they play non kid friendly music on the bus and all the graphic artwork along the ceiling and walls is something a child might have nightmares about while napping. It’s kid friendly but alterna inspired just like the neighborhood it sits in. My favorite savory sandwich is called The Southsider (pictured above) consisting of artichokes, sun-dried tomato, mozzarella and mushrooms on grilled sourdough bread for $5. There are plenty of picnic tables outside and a full size bus for seating so there is enough room to accommodate the crowds even when it’s raining. Why else do I love this place? Well they have a cute guy named Cameron working there although I can’t guarantee he’ll still be around by the time you read this. In any case at least you walk away with a full stomach if not an eyeful of something more. Oh yeah, they accept debit cards and they are open until 2:30am on the weekends. Ridiculously cheese-tastic. My friends call me a coffee snob. Certifiable at that. I can’t really argue with them because I know that it’s true. I live in a city that encourages such snobbery. Portland has more coffee shops than is really necessary but I love having options rather than being stuck with corporate god-awful coffee. Yes, you know which one I’m talking about! 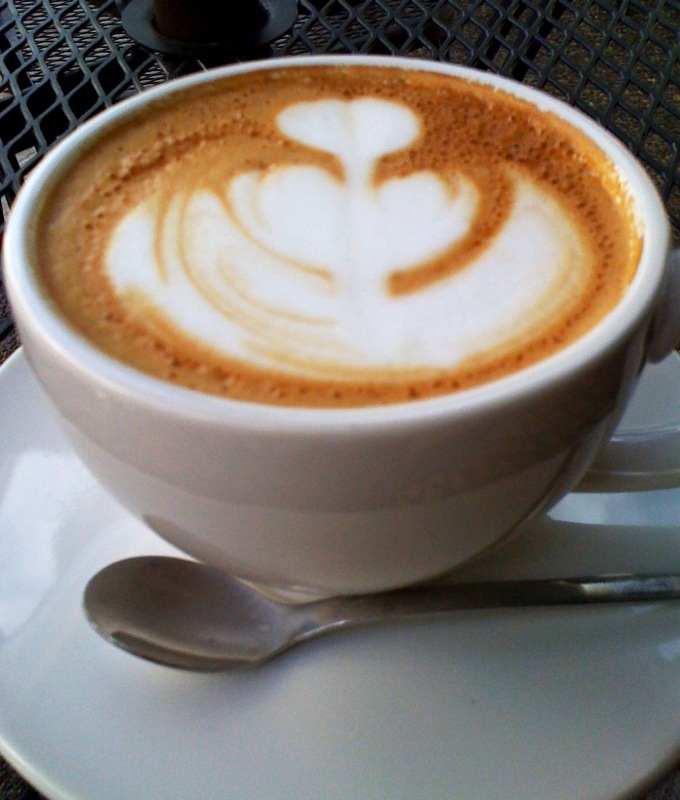 Good coffee isn’t created by just pressing a button. You need to have working knowledge of the beans, how to extract the flavor correctly and how to create dreamy creamy foam. I also cannot forget the beautiful latte art that tops my drinks. I end up taking a momentary pause before enjoying my cup of coffee because I hate to ruin the pretty design!